Bilateral amputee on the cover of Dazed and Confused magazine, September 1998.
foot with coloured toenails is visible in the frame, the other reaches out to frame-left. the doll: here, her body is wholly artificial. The Heather Mills-McCartney Cosmesis (HMMC) from Dorset Orthopaedic has a standard range of 25 colours. In October 2002, Heather famously removed her artificial limb on Larry King Live after the veteran talk show host asked her about it. She said she did it to take the stigma away from disability and to help other amputees not be embarrassed by their disability. That particular show was nominated for an Emmy. 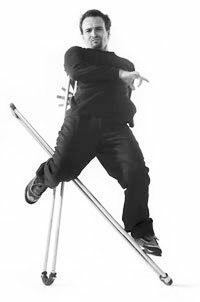 Diagnosed at the age of 5 with osteonecrosis (a bone disease which, for Shannon, means bilateral deterioration of tissue cells in the bones of hips), Shannon dances on crutches, and has developed an extraordinary vocabulary with impeccable timing, fluidity and body awareness. Spatial Theory includes a live narrated video segment that that examines his street performance explorations. 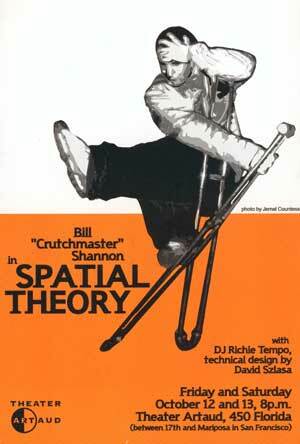 With the combined forces of his legs and his crutches, Shannon is, simply put, a four-legged, hip-hop wonder. "On a muggy summer afternoon, the physically disabled break-dancer-performance artist [Bill Shannon] follows in the foot-steps of one of his idols, Charlie Chaplin, by staging pratfalls in the busy street. Off to the side, a hidden assistant videotapes the action Candid Camera-style. "As Shannon, a.k.a Crutchmaster, pops off the end of the rail, an accident seems inevitable. No one is there to catch him. But just in time, he manages to right himself in midair before landing gracefully on a pair of crutches, like an Olympic gymnast completing a perfect routine. Slack-jawed bystanders stare in amazement. A rotund middle-aged man in shirtsleeves makes the sign of the cross and leaves." 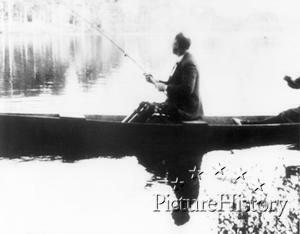 FDR fishing in a canoe with his leg braces visible. Art allows me a sense of freedom, to express myself in a way my body cannot through movement. 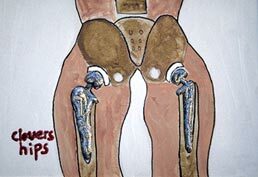 In April of 2000, a Call for Entries went out to artists worldwide, asking those who currently have or have ever experienced an orthopaedic condition to submit their work and tell their stories for a themed art exhibit, eMotion Pictures: An Exhibition of Orthopaedics in Art. An orthopaedic condition can be either a disease or condition that affects muscles, bones and/or joints. Arthritis, osteoporosis, scoliosis, spinal cord injury or other spine/back conditions, cerebral palsy, amputation, spina bifida, broken bones, and joint replacement are some examples of orthopaedic conditions. 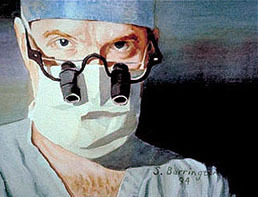 A similar Call for Entries was issued to orthopaedic surgeons, seeking artwork that illustrates some aspect of the orthopaedic surgeon's feeling about the patient/physician partnership or making a difference in the lives of patients, why he/she became an orthopaedic surgeon, practicing the art of healing, frustration, outcomes, or compassion. 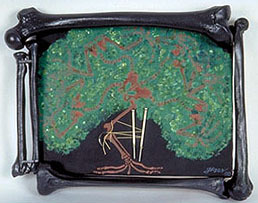 The figure of the crooked trunk of a young tree first appeared in the 18th century in Book III of Nicholas Andry's L'orthopaedie. His intent was to demonstrate the conforming forces needed to correct the crooked leg of a child. It has since been adopted as the international icon for orthopaedic surgery. This is my interpretation of the symbol. Seven-year old was playing barefoot football in his neighborhood in Alabama when he was tackled by his brother. Dr. Steven Barrington, an orthopaedic surgeon and Jonathan's father, took x-rays and discovered he had broken 3 bones in his foot. " I had to spend the rest of my summer on crutches. Even when our family went to the beach before school started,"
Taiwan native Chin Jung (Lisa) Baw has been painting for a decade now, since she was five. Born with severe cerebral palsy and expected to never learn to walk or speak, her mother's encouragement helped her discover art as a means of therapy and communication. 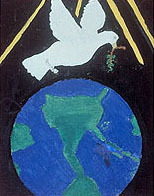 Her work was even chosen by IBM to grace their yearly calendar and Thanksgiving cards. "I firmly believe that art puts ability in disabilities." I really hope people in my world could be that close to me. And I wish I would make lots of friends one day. It was inspired by the drive and spirit that we all have to help improve patient care and fight musculoskeletal diseases. 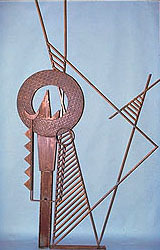 The piercing lines indicating the direction of movement illustrates advancement of science represented in art. 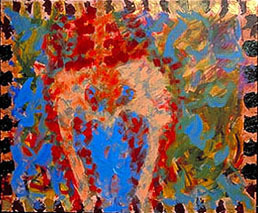 This piece was inspired by a patient Dr. Benevenia treated after her breast cancer spread to her bones. He performed a hip replacement to restore her ability to walk, and her gratitude was beyond measure. 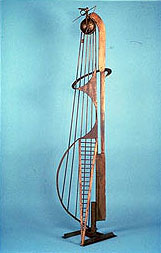 The lines of this sculpture are meant to represent an almost musical, soothing flow; a harmony with the human nature and spirit. The foot is the foundation of the body. It represents the strength, balance, coordination and aesthetic beauty that make motion possible. 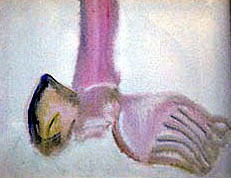 The beauty of the foot is in its form and function; the beauty of this painting is that depicts the emotion of the foot in motion. Mrs. Clover Gloriande dealt for many years with degenerative arthritis of both hips, and Dr. Berger performed total hip arthroplasties on her with excellent results. 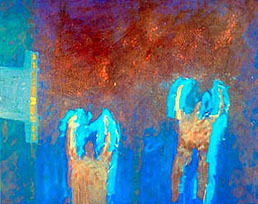 It is my wish to convey images of disabled people's ordinary dignity, humanity and self-respect. 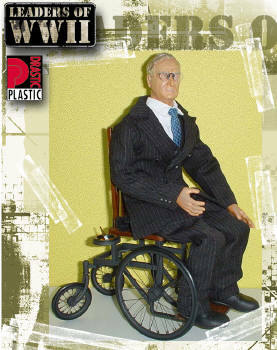 Being a person with a disability is an integral part of my life and identity. Without any emotional charge, I am looking steadily in a mirror. I am also gazing back at the viewer of the painting, mildly curious about you. As a child with polio, her right hip failed to properly develop, causing her right leg and foot to atrophy making them much smaller than the left. 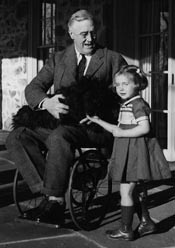 Paralyzed from the waist down with polio, Burns had four leg operations before age 13 and utilizes leg braces and forearm crutches, enabling him to walk. 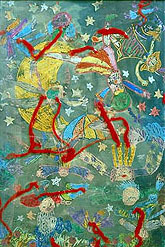 he has traveled the world extensively, incorporating his second passion -the water- into the hundreds of works of art he created during his journeys. "Water was the great equalizer," he explains. "Unencumbered by hardware I could play and compete in games with my friends. ...illustrates the feeling of reaching and stretching towards the wall or goal for which one is swimming or striving for.